If you're familiar with my writing, you're well aware of my daughter's obsession with American Girl. I also have a fondness for the line. 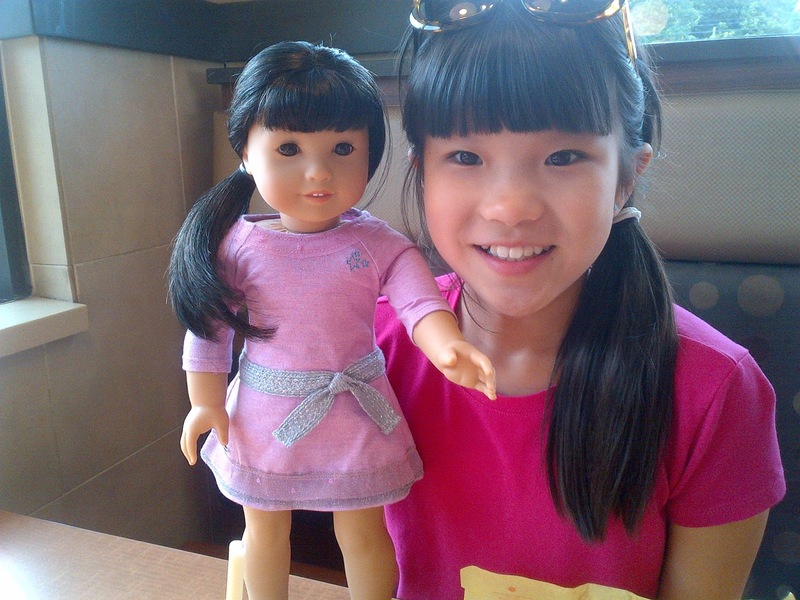 After the company finally took action after our successful campaign to include Asian dolls in the mix and produced a one that was an absolute twin of Madeline, they had a fan for life. No trip to New York City with my daughter is complete without a trip to the Fifth Avenue store. At last count, she has ten dolls and all the very expensive accoutrements that go with them. Imagine my delight when I discovered a store that sells donated, slightly used American Girl dolls, clothes, furnishings and books tucked away in White Plains' business distinct. Eureka! The small sign for GirlAGain, in the same typeface and color used by American Girl, caught my eye as I made my way up Martine Avenue. The tiny shop is tucked into a small strip of buildings adjacent to an apartment complex and is filled with American Girl dolls both old and new. Surprisingly, there are also of plenty of 'retired' dolls for sale for a fraction of what they're currently going for on Ebay. But this is no ordinary resale shop. GirlAGain is the brainchild of Marjorie Madfis, a former IBM executive, who started Yes She Can Inc, a non-profit that trains autistic women to prepare them for the workplace. She opened GirlAGain two years ago as a training ground for these young women (between 17 and 27) who have been diagnosed with autism. All of that was secondary to my daughter when we visited this past weekend and she found the original 'Samantha' -- in perfect condition and still in the box, her original accessories and a few of the AG books on her summer reading list. We bought it all, of course. 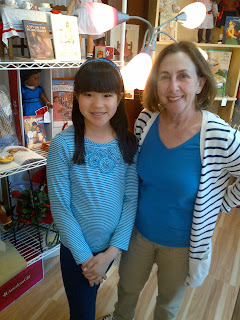 Marjorie was in the shop with two young women who engaged in a lively conversation with Madeline about their favorite dolls. The women also had extensive knowledge about the history of the brand which both Madeline and I found fascinating. 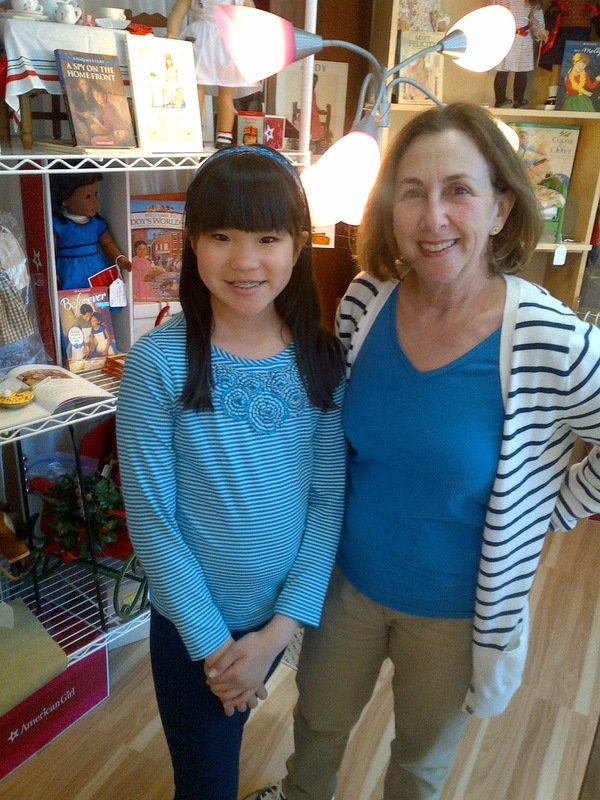 Knowing how protective American Girl is of their brand (I've had an easier time getting quotes from A-list actors' than AG company reps for the piece I did for Forbes on their lack of Asian dolls), I asked Marjorie if they were aware of her organization and shop. "Yes," she told me, "But they said it wasn't aligned with their mission." That's too bad because Marjorie is doing a wonderful service and making a lot of girls -- young, old and all grown-up, very happy. I think it's fabulous that there is a store where girls can go to buy genuine American Girl merchandise at much lower prices than in the company stores and on the website (and without the trip to NYC). Marjorie also runs a full slate of events for customers with authors of the AG books as well as other fun activities that require a small registration fee. It's particularly gratifying to know that GirlAGain is leveraging a brand whose marketing is based on messages of empowerment for young girls to give young women with autism opportunities to learn valuable skills that they might not otherwise get. "I'm not in the doll business, I'm in the jobs business," Marjorie told me. I'd say she's in the happiness business and doing a bang up job of it at that.